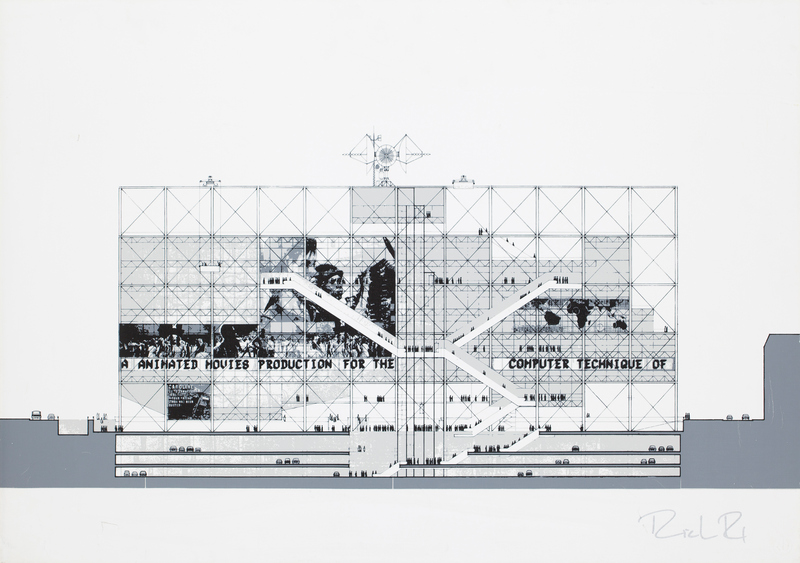 Signed copy of architectural drawing by Centre Georges Pompidou architect, Richard Rogers. In the 1970′s architects Renzo Piano and Richard Rogers, both unknown at the time, collaborated and erected one of the most famous and radical buildings of our time, Centre Georges Pompidou. The cultural center in Paris, France turned our world inside out, literally. It all began with Georges Pompidou, President of France from 1969 to 1974, who wanted to construct a cultural center in Paris that would attract visitors and be a monumental aspect of the city. Receiving more than 150 million visitors since is completion thirty three years ago, there is no doubt that Pompidou’s vision became a successful reality. More information on Centre Georges Pompidou after the break. In order to choose the architects for the project, the president held a competition and many entered, including some of the most famous architects in France at the time. People were astonished, however, when the design of Renzo Piano and Richard Rogers, both not famous at the time, won the competition. Their entry exemplified constructivism and was a high-tech modern cultural center structured with a system gerberettes and trusses unlike anything seen in the architectural world before. Their concept, depicted in one of their competition drawings as a collage, was portraying the museum itself as movement. The other concept in their design, and perhaps the most obvious, was exposing all of the infrastructure of the building. The skeleton itself engulfs the building from its exterior, showing all of the different mechanical and structure systems not only so that they could be understood but also to maximize the interior space without interruptions.